Interesting Information: Mercola Post: Should You Get the Flu Shot? Mercola Post: Should You Get the Flu Shot? As I noted in the previous post, I will be 73 in March 2018. The subject of the flu and shingles vaccines comes up frequently in my network of senior citizens. Please read the section in the previous post about why our doctors are pushing these two vaccines for seniors. This Mercola post provides much-needed information. Here is a synopsis, and the link, which has a lot of information beyond the synopsis, is below. 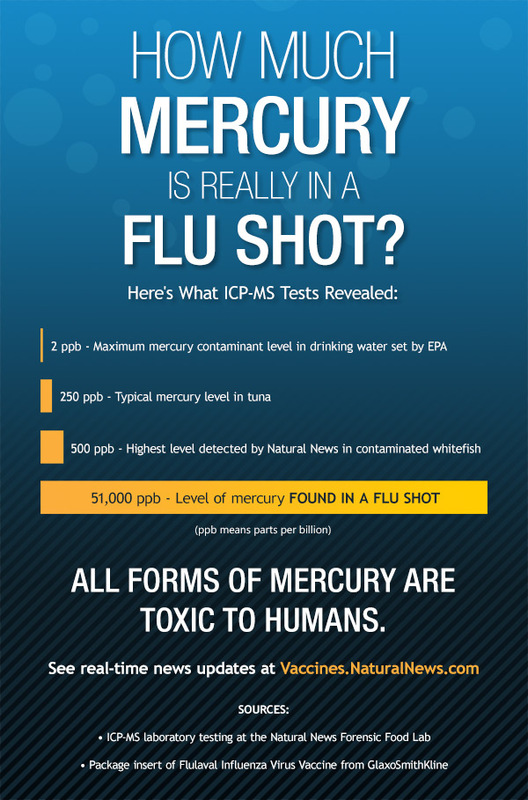 Additionally, the flu shot still has mercury in it. Drug store employees are not properly trained in all cases to administer the shot and would likely have no training of what to do if there is a dangerous reaction. There is mounting evidence that multiple flu shots reduce your ability to handle the flu. Immunologists are quite clear that they do not fully understand the human immune system. Vaccines have many, many unintended consequences that are detrimental to human health. These consequences are well documented, but are not discussed widely by mainstream media. One of the better vaccine informational sites is the National Vaccine Information Center, NVIC.org. Interesting Information: What About Getting the Chicken Pox and Shingles Vaccines? What About Getting the Chicken Pox and Shingles Vaccines? I will be 73 in March 2018. The topic of flu shots and shingles vaccines comes up often in my network of senior citizens. I had chicken pox as a child, but I got shingles last May. And let me tell you that shingles is NO FUN. I still have nerve damage and itching. The flu and shingles vaccines are heavily promoted by doctors and nurses for those in my age range. The “why” of that is complicated and isn’t about human health. Doctors and nurses are now workers in an industry where actual science is often no competition against profit. There is, also, a monopoly formation going on in medicine in which outside businesses are buying up hospitals and doctors’ practices, and they are calling the medical shots. Big Pharma profits from all vaccines and is trying to expand its market share. Further Big Pharma and doctors cannot be sued for any vaccine damage–and there is plenty. The so-called “vaccine court” has paid out billions of dollars for damage incurred by individuals from vaccines. Big Pharma has created pretty lucrative incentives for individual doctor practices and hospitals. Big Pharma has even been able to get the US government to write laws that incentivize hospitals to give vaccines. The higher percentages of vaccines given, the bigger payout the hospital gets from medicare. Insurance companies incentivize individual practices. It is a rigged system. And if you are not aware of it, and most aren’t, you just go along, mostly because we should be able to trust our medical personnel. They are, many times, good medical people. But they, too, are trusting of “the system.” Or their hands are tied as they are, now, just workers in the system and would be fired if they do not follow the “standards of care,” which has been crafted by industry. Let’s just remember that doctors are NOT SCIENTISTS. They are practitioners who know only what they are taught unless they decide to research for themselves. And most don’t. Besides, as I said, it is a very lucrative system for them for the most part. The link below takes you to a comprehensive GOVERNMENT study out of the National Institutes of Health that concludes that the chicken pox and shingles vaccine (they are the same thing) have created significant unintended consequences, don’t work permanently, are creating unnecessary and significant expenses for people, and are creating a cycle of treatment and disease. THIS VACCINE SHOULD BE STOPPED. The cycle of treatment and disease derives in part from the fact that shingles is a LIVE virus and sheds to other people from someone who got the vaccine. Those test tube strains are most likely not the same strain as the wild virus I got as a child. So, I was unprotected and got shingles. Prior to the universal varicella vaccination program, 95% of adults experienced natural chickenpox (usually as pre-school to early elementary school children)—these cases were usually benign. In the prelicensure era, the periodic exogenous boosting that adults received from those shedding VZV resulted in long-term immunity. This high percentage of seropositive individuals and their long-term immunity have been compromised by the universal varicella vaccination of children which provides at best 70–90% protection [142,163–166] that is temporary and of unknown duration—shifting chickenpox to a more vulnerable adult population which, as Dr. Jane Seward cautioned in 2007, carries 20 times more risk of death and 10–15 times more risk of hospitalization compared to chickenpox in children . Thus, the proponents for universal varicella vaccination have failed to consider increased HZ-related morbidity as well as the adverse effects of both the varicella and HZ vaccines which have more than offset the limited benefits associated with reductions in varicella disease. The universal varicella (chickenpox) vaccination program now requires a booster vaccine for children and an HZ vaccine to boost protection in adults. However, these are less effective than the natural immunity that existed in communities prior to licensure of the varicella vaccine. Hence, rather than eliminating varicella in children as promised, routine vaccination against varicella has proven extremely costly [60,62,168] and has created continual cycles of treatment and disease. We love our pets so much. We want to do the best we can for them. As with our own health, since health care is now an industry, we must be careful to whom we listen. We must research. This video shows the problems and links to a web site with information. I can also tell you that when I was little, the house dogs ate table scraps as dried dog food had not been invented, did not have vaccines beyond rabies, and lived to ripe and healthy old ages. Allergies, skin problems, behavior changes, autoimmune disease, seizures, injection-site cancers — these are just a few of the well-documented adverse vaccine reactions in dogs and cats. Pet vaccination is much more harmful than most people underastand. Why Are So Many People Choosing Not to Vaccinate? This series of 12 essays pretty much covers the anti vaccine argument. It is chock full of links to further educate–and of course the links are to reputable sources, studies, etc. Be fully aware that the “story” you’ve been told in the media and in your doctors’ offices that this is “settled science” is far from the truth. And, remember, that science should never be totally “settled.” It must always be open to exploration and refinement. Otherwise, it just morphs into belief system, not science. You owe it to yourself and your family to read these essays. The first essay addresses the “famous/infamous” vaccine skeptics. A Comprehensive Review of Vaccines – Part 1 of 12 What is With All These Vaccine Skeptics? Most people have a difficult time understanding why any parent would choose not to vaccinate their children. After all, we have been assured by our doctors that clinical trials show that vaccines are safe and effective and that we need to vaccinate to protect everyone. So what’s the reason for these people to refuse vaccination for their children? Unfortunately, the further we objectively researched the whole body of evidence surrounding vaccines, the more difficult we found it to come to the conclusion that vaccines are safe and effective. The truth is, there isn’t just one reason for vaccine skeptics to forgo vaccination. There are many. Well here’s another crack in the HPV/Gardasil vaccine corruption/scam. Enough young women have been hurt now that the truth is coming out. Baseline truth: public/private partnerships DO NOT WORK when the “public” part is staffed by those from the “private” part and who are benefitting financially. Here’s some quotes: read the story for more details AND for Lee’s letter. Here’s a post that kind of got lost in the holidays. Tagged with medical math, Meningitis vaccine, New York State and vaccine mandates, Robert F. Kennedy Jr. Everywhere I go these days, there are signs advertising the availability of not only flu shots, but a host of other vaccines as well. Who, may I ask, in the grocery store is qualified to give a flu shot??? This analysis came through my Facebook account this morning, but it is not new information. NO AMOUNT OF MERCURY IS SAFE FOR HUMANS. Giving this shot to a pregnant woman has never been tested for safety for her or for the baby. Ditto for children or the elderly. I heard an ad on the radio coming home today for a “super flu shot” for the elderly. …do not forgive them for they do know what they are doing.